When it comes to making smart decisions for your financial future, investing in your education is definitely one of the smartest. For most people this means going to a college or university and getting a degree in nursing, accounting or a masters in human resources. This sure is the path that society expects of us, and statistically is a very good choice. People with college degrees, on average, earn vastly more than those who don’t. However, not everyone has the opportunity to go to college. It’s extremely expensive, takes at least four years of your life, and prevents you from working full time in most cases. And in today’s world of ever changing technology, the things you learn in college can become outdated in just a couple of years. All through our younger years we are told that “you have to go to college to get a good job”. And while that may be true still in most cases, there are exceptions. The rise of technology has provided an alternative that may be just as lucrative, and is much easier to obtain than a full degree. Technical certifications. These little pieces of paper may not come with the prestige and four years of partying that a degree does, but they can get a job just as surely, and maybe even more so. And if you already have a degree but are looking to boost your resume, then they are the perfect route to go in. Technical certifications are essentially a standard determining that you are well equipped at a certain skill. For instance, the Comptia A+ computer technician certification lets potential employers know that you are skilled enough with computers to fix pretty much any problem that arises with a PC. They come in many varieties, and come from many different sources. Companies like Comptia have them, as well as tech giants like Microsoft. If you earn one, it lets people know that you are well versed in that technology. Obtaining a technical certification couldn’t be easier. First, decide what you want to get certified in. Popular choices are computer repair, web design, and programming. Then figure out which company you want to get certified from. It may be smart to get several of them at the same time. If they are in the same subject area, they will both test on most of the same subject areas, so the second one will be very easy to get once you have the first. Once you’ve figure out where you want the certification from, get a study book that is specifically for that test. They typically cost less than just a single book you’d have to buy for one college class. Then just do some studying and take some practice tests, making sure that you’re ready to pass. The exams aren’t cheap, so you want to pass them the first time. Once you feel you’re ready, schedule the exam through whatever system the company provides. They will typically be taken at either a professional testing center or at a university. Pass the test, and you’ll be certified! Mainly, these certifications will help you get a job in some sort of technical field. If you get the A+ certification I mentioned above, you’ll be able to get an entry level computer technician position at most companies, even without experience or a degree. And if you have a degree, they can really boost your marketability to employers. They show that you are seeking to continue your education, learn new skills, and keep up with modern technology. All great things that employers look for in a candidate. I got my A+ certification when I was a sophomore in high school. The next summer while working in an intern computer technician position I was given a $2 an hour raise, just for having this little piece of paper. Sure, taking the tests was just over $100 if I remember correctly, but that investment paid off very quickly. I also have the Microsoft Software Development Fundamentals Certification, which padded my resume significantly when I was applying for web design jobs last month, and was a contributing factor I’m sure in getting one. Getting a technical certification isn’t something that everyone needs to do. In fact, there aren’t very many people who really need one. But if you are working in the technical field, or trying to get to that point, it is something that you should strongly consider. And, perhaps most importantly, you avoid students loans when getting one, so the long term benefits may outway even a traditional college education. Author Bio: James Petzke is a college student, entrepreneur, and the blogger behind This Is Common Cents, an online personal finance magazine about frugality, making money, financial independence, and living the dream. Nice post. This is exactly the idea that was behind my post yesterday on if it’s still worth it to get a college degree. For many it still is, but there are a growing number of opportunities, just like this that many don’t think of. I can see the benefit of the certificate in that it allows you to get a decent job without all of the expense of a college degree. Yeah the main benefit of skipping the degree is definitely the cost savings. Yeah you definitely need to be careful of that. If you end up with a certificate that no employer recognizes, you’re back to square one. A lot of the times if you are already working in that field you can get your employer to pay for the certification in exchange for working there a set number of years after completion. I think this day in age the degree if from a regular college just opens the door for you. In large metro areas I have noticed that some employers take notice on where the degree came from ie…ivy league schools… just in my experience so far. Yeah getting an employer to pay for the certification is definitely the ideal situation. If you have that kind of opportunity, definitely take advantage of it! Great article James. I have know a few people who were in more technical/labor jobs who got a specific certificate and they also were given a raise in their pay. While these can range in price to get they are well worth it if you are in a specific job field. Yeah it’s amazing how big of a raise you can get just from passing a couple tests! Great post and getting a technical degree could be a very wise thing depending on the field you’re trying to get into. I’ve looked at a few 2-year degrees in the past but I’m not always sure how valuable they’ll be for the ones I was particularly looking at. Two year degrees are another, cheaper option as well. They often times can get you a job that pays similarly to one that requires a full four year degree for half the cost. Although it’s not a certificate per se, more of a diploma, my husband got an in-demand technologists diploma rather than full on engineering degree and makes almost as much as I do holding 2 degrees! With the right employer, certifications mean everything! I have a “certificate” from the EPA, except that the program is free and you self-test, so the only thing that the certificate relly proves is that you know how to use a printer. But even if the certificate isn’t recognized by anyone, it looks good on the resume and there was a fair amount of useful information in the courses! Yeah any kind of certificate that looks good on a resume is worth having! 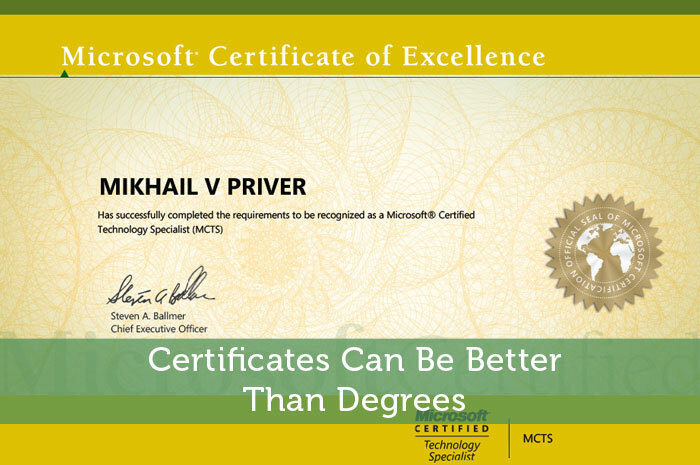 MCSE and A+ are definitely useful for computer techs/IT people. I don’t think they work as well for programmers or other less by-the-book career paths though. There a BS/MS combination is certainly the desired credential. Yeah you’re right, for engineers and other higher level positions it makes a lot of sense to have a degree. But for the lower level tech fields certificates can work just as well. In health care fields, certificate occupations can do pretty well. My office has two certified opticians, which involves on the job training and taking a test. A good optician in a busy practice can make over $50K annually, more than my husband who is a teacher with a master’s degree! Sounds like an excellent career path to me! Good Post! When I was studying at university I did an SIA qualification which allowed me to work as a doorman in nightclub security. This changed my part time job from £5.50 per hour to almost £14 per hour – Well worth the couple of hundred quid it cost to do! Yeah that is exactly what I did, not quite the same level of pay jump, but still a pretty nice raise. Where I work you must have a degree to be even considered for the position (legislative requirement), what then differentiates you from the competition is the type and quality of the industry certifications that you have. Yeah certifications aren’t just for getting lower level jobs, they can really help set you apart for the higher level ones as well. This can be absolutely true. Take my line of work for example. As a project manager I have a MBA and a PMP (project manager professional certificate). When looking for a different job, PMP is much more preferred than MBA in the project manager world . You’re definitely right, having the MBA is also a huge boost. When it comes to technical degrees I agree that they are not very good for applied knowledge. I do feel that they are way better at measuring ones ability to understand concepts and theory and therefore are a better measuring stick to determine if one can learn or understand complex concepts. And that is why they can be such a good thing for an employer to see. I’m with NicoleandMaggie…you have to be careful! But how true this can be! Honestly, I wouldn’t even be in the degree program I’m in right now if it weren’t preparing me for the certification. The certification is where the money is! I look at it this way: certificates are often most responsible for training a student in a very specific and applicable skill that a tangible market exists for, regardless of demand (which is usually favorable). Degrees are increasingly earned in liberal arts which helps train thought, communication, research, etc. But it does not necessarily teach viable or concrete skills like the ability to clean teeth, cooking on a line, or managing a website. For their cost, certificates are often an incredible deal compared to degrees and definitely worth looking into for further training. Good points, especially how you mention ‘further training’. I think college is still a good place to build your foundation and then a certificate is where you can specialize and learn actual job skills. Great information here! Certificate programs are definitely something to consider as you look into your education. Especially if you are like me and aren’t the most amazing classroom student. I excel with hands-on and practical experience. Yes for some people the classroom just isn’t for them. So it’s awesome that there’s an alternative where you can learn necessary job skills. where would you go to try and obtain an A+ certification if you aren’t in high school anymore? Great post. Gives some hope to the dilemma I’m experiencing right now. Would Graphic Design be a field where a certificate would be considered acceptable? Most GD postings I’ve seen ask for a degree or 3-year diploma in the field, but I’ve already completed my degree in Visual Arts and don’t have the time or money to do another. Would a certificate program combined with my current degree be enough to get my foot in the door, or will I have to bit the bullet and do 3-4 more years of school?? Thanks for the post.